Woodfield Country Club is a 24-hour manned gated community situated on 830 acres of lush tropical landscape and shimmering lakes. This exclusive family-oriented private club is nestled in the heart of beautiful Boca Raton, FL. Woodfield Country Club has been recognized as a 5-Star Platinum Club of America since 2006. Woodfield Country Club is comprised of 1,300 homes located throughout 20 separate villages, each of which has been intricately designed to have its own distinct charm and ambiance. From English-inspired brick paved roads to rustic Mediterranean-style architecture, and even a Key West inspired village with pink pastel colors and tropical plants, each village is truly unique. There are numerous housing options available in Woodfield to suit every type of home buyer, including patio homes, charming villas, townhomes, single family homes, and grand custom luxury estates. These lovely residences in Woodfield range in size from 1,500 to over 10,000 square feet. Woodfield is proud to be a sanctuary for families and Baby Boomers who value living in an active, family-friendly community. Woodfield is the perfect option for those seeking a community that embraces families and offers lively social scene. Woodfield Country Club offers families a beautiful, safe environment where they may enjoy all the resort-style amenities year-round while developing the friendships and lasting relationships that make a community truly feel like home. Woodfield offers a variety of memberships to suit every different lifestyle, such as golf, social, and sport. A majority of members at Woodfield Country Club live in the community full-time and enjoy a full social calendar of events year round. The Club offers something for everyone with various lectures, book reviews, cooking classes, social mixers, card lessons, and film series available for members to enjoy while also providing plenty of opportunities to interact and meet new friends. As a convenience for busy parents, the Club also offers after-school activities and seasonal camps for children. Woodfield Country Club features an 18-hole championship golf course, originally designed by Joe Lee, and completely redesigned by Bob Cupp in 2002. The dynamic layout of the course, with its rolling terrain, smaller greens, and various water hazards, is sure to challenge golfers of all skill levels. The Club also boasts a full staff of golf professionals, offering group and private lessons, as well as a state-of-the-art video system used to help members continue to improve their swing and overall game. There is also a fully stocked Pro shop offering the highest quality gear, as well as a huge assortment of ladies' and men's golf apparel. Woodfield Country Clubs tennis facilities are second to none, having been recognized by both the Tennis Industry and the United States Tennis Association as the Private Club of the Year for its tennis program and amenities. Woodfield offers one Decoturf, seven rock-pipe, and twelve Har-Tru clay courts making this one of the most versatile court complexes in the area. With eighteen lighted courts, members can also enjoy high-quality evening play. Woodfield Country Club also features a full-service salon and spa for members to relax and enjoy while always looking their best. The salon's professional staff offer a variety of services in a welcoming atmosphere, including luxurious pedicures, teeth whitening, make-up applications, as well as haircuts and color services for men, women, and children. The Club's luxurious spa offers a variety of custom services to help members relax and de-stress including, organic facials, body scrubs, aromatherapy and massage treatments, as well as spray tanning and microdermabrasion treatments. Woodfield's community pool complex features a 12,000 square foot heated lagoon-style swimming pool, a separate lap pool, and a fenced-in interactive water playground for children, complete with play fountains and a waterslide. The pool complex is surrounded by lush, exotic landscaping and elaborate stonework, making it the perfect place to enjoy a casual poolside meal or a refreshing beverage from the outdoor bar. Woodfield Country Club features a 38,000 square foot fitness complex complete with state-of-the-art equipment including free weights, resistance machines, and full training room with everything members need for a comprehensive training program. The Fitness Center also has an extensive Group Fitness schedule offering over 40 classes each week, including Zumba, Yoga, Body Sculpting, and Aquacize. 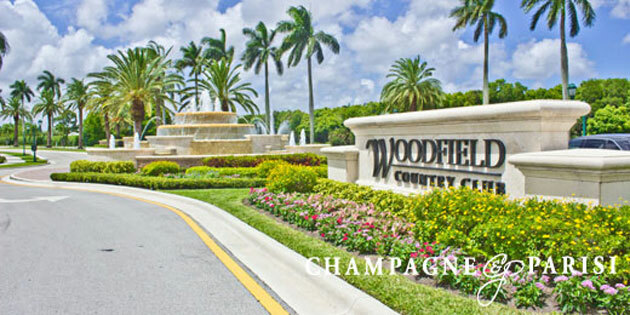 Woodfield Country Club is conveniently located on Yamato Road, West of Jog/Powerline Road in West Boca Raton, FL. This ideal, premier location is just minutes away from a plethora of exceptional dining options, a variety of shopping opportunities, the beautiful Boca beaches, community parks, and many of the areas amazing venues and entertainment options, allowing its residents to enjoy the best of what Boca and the surrounding areas have to offer. This family-friendly community is also zoned for some of Boca Raton's top-rated schools, including Calusa Elementary, Omni Middle, and Spanish River Community High School. If Woodfield Country Club seems like a place that you would consider calling home, you may also want to look into Broken Sound Country Club, another Five-Star Platinum Club of Excellence that also offers its members a luxurious country club lifestyle with world-class amenities in a warm, family-friendly atmosphere. Woodfield Country Club's sister community, Woodfield Hunt Club, is a family-oriented community located in West Boca Raton, comprised of 320 single-family estate homes. Residents of Woodfield Hunt Club who enjoy the country club lifestyle have the option to join Woodfield Country Club, though membership is not mandatory. If you would like to learn more about Woodfield Country Club or any of the surrounding family-friendly country club communities in Boca Raton, please contact us by calling 561-998-9015. You may also reach us using our simple online contact form that is provided below. We look forward to assisting you in finding your next dream home!